is printed in full colour on genuine hard-wearing plastic. It’s the perfect accompaniment for all those other pieces of plastic in your wallet/purse. 1. The supermarket check-out person asks if you have a loyalty card. 2. 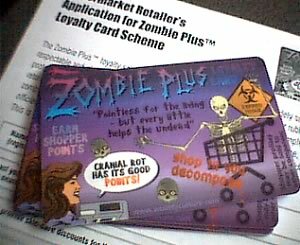 Hand over your Zombie Card, and say: "Do you take Zombie Plus?" 3. When they say "no", you say: "would you like an application form?" 4. If they buzz the supervisor or call for security, head for the exit (employees are trained to be paranoid). We have given away several thousand Zombie cards. Since we don't have many left, we now send them only to people who make a donation (via our Donations page). 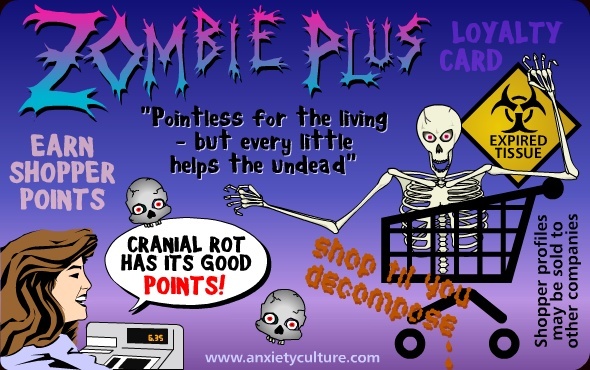 When you make a donation you'll receive an automatic email asking if you want a Zombie Plus card. If you do, you just need to send your postal address in response to the email.